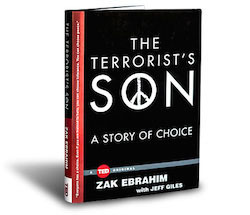 [A] compact, important book… Ebrahim’s life is an eloquent plea to terrorists — indeed, to anyone who commits violence out of bigotry and hatred — to stop and consider the impact on children. The astonishing first-person account of an American boy raised on dogma and hate — a boy presumed to follow in his father’s footsteps — and the man who chose a different path. The idea that reverberates through the prose: Everyone has a choice. Even if you're raised to hate, you can choose tolerance. You can choose empathy. Zak Ebrahim was only seven years old when, on November 5, 1990, his father, El-Sayyid Nosair, shot and killed the leader of the Jewish Defense League. While in prison, Nosair helped plan the bombing of the World Trade Center in 1993. In one of his infamous video messages, Osama bin Laden urged the world to "Remember El-Sayyid Nosair." For Ebrahim, a childhood amid terrorism was all he knew. After his father’s incarceration, his family moved more than twenty times, haunted by and persecuted for the crimes of his father. Though his radicalized father and uncles modeled fanatical beliefs, the hateful ideas never resonated with the shy, awkward boy. The older he grew, the more fully Ebrahim grasped the horrific depths of his father’s acts. The more he understood, the more he resolved to dedicate his life to promoting peace. In this book, Ebrahim traces his remarkable journey to escape his father’s terrible legacy. Crisscrossing the eastern United States, from Pittsburgh to Memphis, from a mosque in Jersey City to the Busch Gardens theme park in Tampa, The Terrorist’s Son is the story of a boy inculcated in dogma and hate—a boy presumed to follow in his father’s footsteps—and the man who chose a different path. Everyone has a choice. Even if you're trained to hate, you can choose tolerance. You can choose empathy. The fact that my father went to prison for an unfathomable crime when I was seven just about ruined my life. But it also my made my life possible. He could not fill me with hate from jail. And, more than that, he could not stop me from coming in contact with the sorts of people he demonized and discovering that they were human beings—people I could care about and who could care about me. Bigotry cannot survive experience. My body rejected it. I’m convinced that empathy is more powerful than hate and that our lives should be dedicated to making it go viral. In 2013, Zak participated in TED's talent search in New York City, and was selected to speak at the main TED conference the following year. 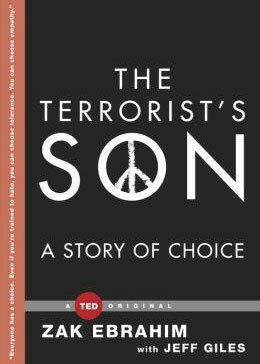 His TED talk was the inspiration behind The Terrorist's Son. Both will be released on September 9, 2014. Jeff Giles has written for Rolling Stone, Newsweek, and the New York Times Book Review, as well as serving as a top editor at Entertainment Weekly. He teaches a journalism course at NYU's graduate school, and lives in Brooklyn with his family.